Hey party people. Dust off your raving shoes and Melbourne Shuffle on down to the ACMI this November.. with your kids. Why? Because the BFLF Crew are all set to celebrate Melbourne Music Week with a Family Rave in the heart of the city. That's right folks, your raving days are not over yet because BFLF Raves are for children too. Join Spacey Space and Scott Alert as well BFLF residents Dave Juric and Narel as you dance the n̶i̶g̶h̶t̶ afternoon away with your kiddos. What can you expect from the Rock Stars and Pop Stars Family Rave featuring Spacey Space and Scott Alert for Melbourne Music Week? Multi-sensory dancefloor and parachute dance finale. Kids Craft Area with giant mural, themed crafts, and a playdoh table for the littlest ones. Play area with tents and tunnels and baby chillout space with mats. Optional (but highly encouraged) fancy dress: Rock Stars and Pop Stars. Leave your ear plugs at home. 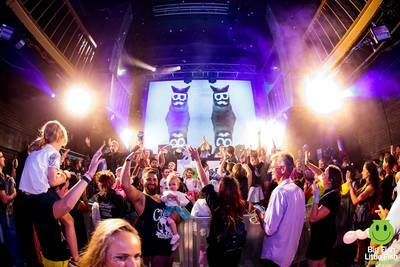 BFLF Raves won't bust your kids' ear drums. Such events are enjoyed at a suitable sound level for ear sizes. Tickets are now on sale for the next Big Fish Little Fish Family Rave at ACMI on Sunday 18 November. Suitable for families with younger children, (8s and under) although older siblings are welcome. Adults are not admitted unless accompanied by a child. More than 4 adults per child? Email melb@bigfishlittlefishevents.com for pre-approval before buying tickets. Tickets: $19 child $27 adult. Pre-walkers free.